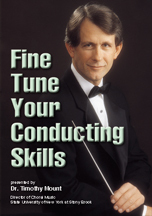 DVD: Fine Tune Your Conducting Skills presented by Dr. Timothy Mount | Santa Barbara Music Publishing, Inc. In this one hour and fifteen minute video, Dr. Timothy Mount, working with his choir, demonstrates and talks about clear beats, well-defined conducting patterns, preparatory beats, cut-offs, and the many challenges of fermatas. Dr. Mount offers numerous tips and warns about a few bad habits to avoid. The video includes a detailed booklet/manual with all exercises notated. "This DVD is a superb contribution to the profession and will benefit both aspiring and experienced choral conductors. Mount has given a tremendous amount of consideration to each of the topics he discusses, and his presentation is a model of masterful pedagogy. If you purchase only one professional videotape this year, I would strongly recommend Fine Tune Your Conducting Skills. This is one purchase that, like a well written text, ought to be considered an investment in your future because each time you view it, you will find something new and enlightening."